The Norfolk Basket Company is a modern business rooted in the most historic of practices, prompted by contemporary ennui and invigorated by tradition. Which is one way of saying that, in the early 1980s, Adrian Charlton was tired of working North Sea oil rigs and eager for a new direction. Unexpectedly, he found himself intrigued by the display of willow baskets he saw at an open air market. With the aid of a government grant aimed at keeping traditional crafts alive, Charlton changed his life completely and apprenticed with a master basket maker to begin the arduous work of learning East Anglican weaving craft. Soon, he had planted his own willow beds, allowing him to see the process through from the ground up. In the late ’90s, Charlton attended a famous French market of traditional crafts and became intrigued with French and Spanish styles of basketmaking, adding to his breadth and making the Norfolk Basket Company even more unique. He taught others his methods and soon had an apprentice named Ruth. Today, her last name is also Charlton. Together the couple have promulgated and modernized an ancient craft that we’re so glad to support — and to use! Willow tension trays that boast classic Catalonian design. This versatile basket is commonly used for serving fruit, bread, or cheese — and prompts us to dream about breakfast in bed. The willow peg basket is a classic picking basket traditionally used for collecting pegs, or clothespins, and gathering berries on the farm. It also happens to look pretty amazing when placed on a table, laid on a bench, or used as a serving vessel. Arm baskets like this were traditionally used by butcher’s boys when they made deliveries door to door. This modern interpretation features a comfortable plait handle, and is perfect for carrying good things to eat to and from your home or market. When it’s not working, we like to fill this versatile vessel with breads, fruits, or even fragrant boughs — depending on the season. Cran baskets were traditionally used in weighing and carrying herring. Their sizes were regulated and standardized by government decree so fishermen would never be paid too little or too much for their catch. This standard size version is made with steamed flanders red, hazel, and chestnut willow. Used to serve or carry, for decoration or for hard work — this basket will endure for generations. 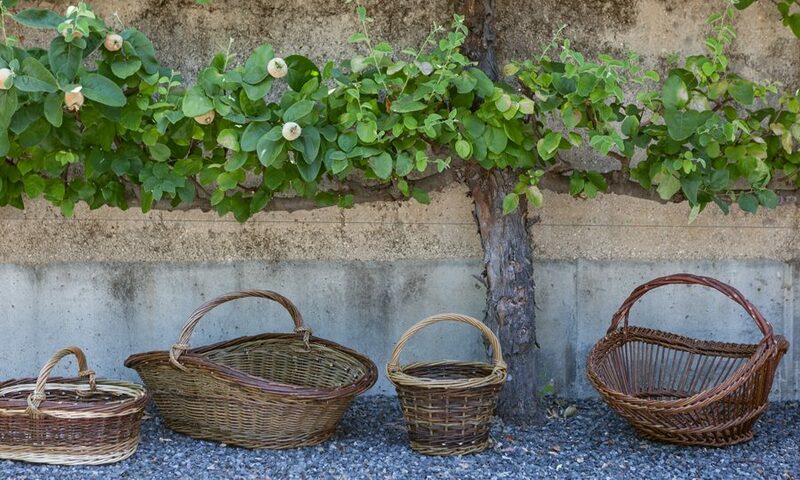 The willow picking basket is a classic gathering basket made by European artisans as these utilitarian objects have been made for centuries. Unique in design, hand-woven from willow with a hand-stitched — not riveted — leather strap that can be worn over the shoulder, or cross body, this picking basket is a piece of art and history. The willow vegetable gathering basket is a traditional basket designed for collecting vegetables and other bounty from your farm and garden. Use it in the garden, use it on the table — this attractive handcrafted basket is as handsome as it is utile. To learn more, go to Norfolk Basket Company. This entry was posted in Meet the Makers and tagged baskets.